Now is the summer of our zombie apocalypse discontent. We've played so many zombie games; we've had glorious highs and depressing lows. We've grown sick of zombie games only to be surprised by good zombie games only to become sick of zombies games all over again. At this point, what kind of magnificent zombie game would it take to shake us out of our funk? Probably not Deadlight. Beneath its appealing graphics and brooding vibe lies a derivative and frustrating game that is rarely rewarding or enjoyable. Deadlight is a side-scrolling platformer with a veneer of gritty realism to it—this is more Resident Evil than Mario. It was made using Epic's hotshot Unreal engine, which gives it a "3D in 2D" kind of feel, though it is in fact a two-dimensional game. The superficial comparison would be to Chair's triumphant 2009 action exploration game Shadow Complex, which also used Unreal. But the comparison is only superficial—I loved Shadow Complex. I did not love Deadlight. Things start off promisingly. It's the mid-1980s and a zombie outbreak has struck Seattle. Called "Shadows," Deadlight's zombies are red-eyed freaks that chase and devour anything that moves. The story starts as the protagonist, Randall Wayne, has killed one of his party members. In comic-book cutscene format, he grittily explains that he had no choice. She was bitten, see, and it was only a matter of time before… oh, you've seen a zombie movie. You know how it goes. Soon Randall is making his way through ruined downtown Seattle on his own, sprinting through a series of broken buildings and vistas that are haunting and gorgeously illustrated. Seattle is an ideal location for Deadlight's sodden, depressing brand of apocalypse, and the art direction shines throughout, particularly in the breakneck opening 30 or so minutes. I started to get nervous when I realized that Randall was literally sprinting through these backdrops—there was no time to appreciate anything, no time to breathe. The whole game has this problem—there's not a lot of meat to it, and what meat there is feels thin and unsatisfying. That's because Deadlight suffers from some serious pacing problems—both story pacing and gameplay pacing. "Darkness does not exist. What we call darkness is the light we cannot see." "You've seen it with your own eyes: Seattle is dead. That blood in your saliva is the only real thing we have left, Stella." WHY: Deadlight suffers from unimaginative puzzles, a nonsensical story, dodgy controls and a patchwork third act. There are plenty of better zombie apocalypses to survive. Type of game: Side-scrolling action/platformer with horror elements and zombies. What I played: Completed the story in around 3-4 hours, though it could have been a bit less. The well-paced opening 30 minutes. Shooting zombies in the head with a pistol feels as disconcertingly satisfying as it usually does. A nonsensical early segment in which Randall must navigate some crazy guy's booby trapped underground lair as the crazy guy follows and offers friendly advice. It's bizarre. The final third of the game is a frustrating mess that feels unfinished. "Deadlight made me miss Seattle. Weird." "The third act is great exercise for your eye-rolling muscles!" "Man, why can't they just make Shadow Complex 2?" Dialogue weirdness notwithstanding, the story itself is ham-fisted and frequently dumb as a post. Nothing makes much sense—they've crammed in pretty much every zombie movie cliché in the book, but with very little explanation for any of it. Why are the soldiers bad? What do they hope to do with the people they capture? Why do they care so much about killing Randall? Who are the people Randall was traveling with and why do I care about any of them? And why the heck does Randall keep finding collectable bits of his diary all over Seattle? There's a painful early diversion to the underground lair of "The Rat Man," a hollow-voiced guy who makes Randall run through a humorously convoluted series of instakill death traps for… some… reason? All while muttering vague B.S. about the nature of man in the soft tones of a level designer who was forced into the sound booth in lieu of a professional voice actor. (With the exception of Randall's workmanlike Solid Snake turn, the Deadlight voice cast leaves a lot to be desired.) What momentum the early chapter had vanishes as players are forced to—I'm serious here—shoot red bulls-eyes with a slingshot to activate pulleys to raise elevators to the next part of the level. Where'd the zombies go? What is going on? I mentioned gameplay pacing as a problem. Deadlight is something of a puzzle game, and a little bit an action game. It's not much fun as an action game, but it could have been a good deal of fun as a puzzle game, had its designers put more time and thought into the puzzles. As it stands, Deadlight doesn't really have puzzles. It has routes. You get to a room, and there is a route to get out. Often (way too often), that route is as simple as: "Push over a shelf, climb on the shelf, climb out the window." Okay! That's it for that room! It almost never gets more complicated than jumping off a wall onto a hand-over-hand wire to a window. In fact, you'll do that precise move a good half-dozen times throughout the course of the game. I never got the sense that I was making choices or using my brain—it felt like I was being herded along a pre-set route. The way the game shunts players along becomes a real problem in the later stages as the difficulty ramps up. You'll wind up sprinting into a room where you needed to slow down, or walking into a room where the ceiling is falling and you needed to run. Many times you'll have no idea of what you were supposed to do until several go-rounds. But then, "difficulty" is a strange concept in this game—Deadlight isn't difficult like a traditional platformer or a survival horror game. More often, it's difficult like a quicktime event. You'll die a lot in Deadlight; in this respect, the game is reminiscent of Playdead's similarly dark and kill-happy Limbo. But where Limbo had some very smart murderous puzzles (and a few humorously cheap ones), Deadlight's kills all feel cheap. There's no way to make it through many of the sections on the first, second, or even seventh time—during a particularly dumb helicopter chase sequence, I memorized the route I'd have to take to the point where I could have done it blindfolded. The only variable was whether the dodgy controls would betray me. And betray me they did—with maddening frequency. The controls in Deadlight aren't terrible, but they never quite feel "right." Melee attacks with your axe involve a lot of clipping, and attacks often don't quite feel like they connect with enemies. Firearms use a similar control scheme to Shadow Complex—aim with the right stick and fire with the trigger—but aiming is spotty and can be thrown by enemies coming from the "background" that are not yet available as targets. Randall isn't as responsive as he needs to be; he'll sometimes swing his axe or leap in the wrong direction, leading him plunging into a tank of water or unable to climb over the top of a fence. Wall-jumping is a strange addition for a game with such a realistic bent, and it doesn't work smoothly or look realistic. Oddly, jumping onto ledges and ladders directly above you can also be quite difficult; it's annoying to try to jump up to a ledge directly above your head only to go careening off to the right and into a gaggle of zombies. 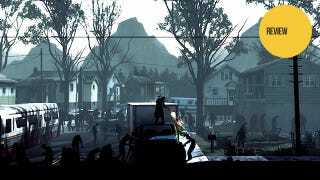 With a bit more time, creativity and a somewhat different gameplay focus, Deadlight could have been enjoyable. That sounds funny, I know—if they'd just changed a ton of things about it it'd have been great! But the general idea is sound. I like the idea of a cold war zombie survival tale in Seattle. The sense of style and paranoid aesthetic are great, and one of its core puzzle mechanics—the fact that zombies can be corralled by taunting them, and must be relocated in order to allow Randall to make a leap-dash past them—is smart and enjoyable in practice. But Deadlight just isn't where it needs to be—it feels rushed and unpolished, more tedious than terrifying. There are other zombie apocalypses more worthy of your time.